I left the Waffle house and drove downtown. Montgomery had a different feel than Birmingham. It felt older, steeped in more tradition, a city with a long past. Turns out that’s true. Birmingham’s story is about a steel industry that evolved after the Civil War. Montgomery’s history is about cotton and was shaped before that war. Here’s the short story on Montgomery. Let’s see if I can sum up a couple hundred years of history into less than 1200 words by getting down to the important stuff. In 1785, Abraham Mordecai, a Sephardic Jew from Philadelphia, established a trading post on the Alabama River in land then held by the British. When Mordecai got there the indigenous Coushatta and Alibamu peoples had already moved on to current day Mississippi, Louisiana, and Texas, territories controlled by the Spanish. They thought the Spanish white men were easier to get along with than the British. Creek Indians had migrated there, so Mordecai married a Creek woman, and traded with her tribe. Business was good. His little post prospered. While the Creeks accepted Mordecai, they were successful in keeping other white people away. Could be they were a tad meaner than the Alibamu and Coushatta. But that didn’t last. While Abraham Mordecai was wheeling, dealing, and making money off the Creek Indians, Eli Whitney, born in Massachusetts and schooled in Connecticut, found himself on the Mulberry Grove plantation in Georgia figuring out how to get seeds out of the local cotton. Southerners had been trying to adapt a mechanical engine (shortened to “gin”) from India that worked fine on long fiber cotton grown in tropical areas of Asia, but not worth a damn on the cotton produced in the American South, which requires only 200 frost free days, can be grown almost anywhere south of Virginia and Kentucky, but holds its seeds tightly packed in shorter fibers. Southern plantations could process only about a pound of cotton a day with existing gins, a huge bottleneck in an industry that was poised to produce a lot more cotton with the right technology. Eli persisted despite setbacks. He later said he was inspired one day by a cat trying to pull a chicken through a fence, and observed that it was only able to extract some of the feathers. Using that observation, he made a wooden drum stuck with hooks that pulled cotton through a mesh big enough that cotton fibers could pass through but small enough that the seeds could not. The seeds fell outside the drum. Eli Whitney’s cotton gin could clean 50 pounds of cotton a day. He and a partner were successful in getting a patent on that new cotton gin validated in 1807. Soon after they were for sale. Back on the Alabama River where Abraham Mordecai lived it was decided the Creek Indians were standing in the way of progress. The U.S. Government, now in control of the surrounding territory, sent General Andrew Jackson there who fought and defeated the Creek Tribe in 1814, and forced them to cede 23 million acres to the United States, land which now makes up Georgia and most of central and southern Alabama. Mordecai’s wife left with her people who were removed to Indian Territory. In 1816, the Creek lands in present day Alabama were sold off at ridiculously cheap prices to white settlers who had their eye on growing cotton. 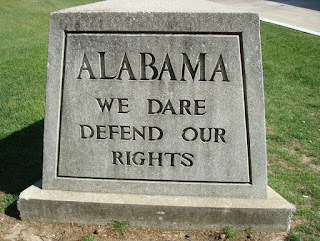 Alabama was admitted to the Union in 1819 and Montgomery was incorporated that same year. Abraham Mordecai said goodbye to his native American wife, stayed in Alabama, bought one of Eli Whitney’s first cotton gins, brought it to the new town of Montgomery, and before you could say “Dixie” cotton became king in the South, with Montgomery, Alabama smack dab in the middle of it. American cotton was soon being sold in markets all over Europe, feeding new industrialized textile mills. Those buyers of cheap Alabama and Georgia land were said to become millionaires after producing but three successful cotton crops. Cotton production expanded from 750,000 bales in 1830 to 2,850,000 bales in 1850 (a 380% increase for those who think that way) and wealth was created at a mind boggling pace. As the cotton industry grew it became even more dependent on plantations and slaves. Cotton could be cleaned by machine but only human hands could pick it efficiently. Those hands were virtually all black, and they were in huge demand. The number of slaves in the South rose in concert with cotton production, growing by 450% from around 700,000 in 1790 to 3,200,000 in 1850. Slave traders used the Alabama River to transport and deliver African slaves from the Caribbean, via New Orleans, to the heart of cotton country. A large slave holding facility and auction house was established in Montgomery near the river. The offices of slave agents surrounded that facility and grew the downtown. Dealing in slaves was profitable too. Montgomery was designated as the county seat in 1822, the state capital was moved from Tuscaloosa to Montgomery in 1846, and for a short time in 1861 it was the capitol of the Confederacy before it moved to Richmond, Virginia. Jefferson Davis was inaugurated as the confederacy’s first president on the steps of the Alabama state capitol in Montgomery. By 1860, black slave labor was producing two-thirds of the world’s cotton supply including 80% of the cotton required by the crucial British market. The American South was the world’s first international agricultural powerhouse, and Montgomery was central to all of it, as was the cotton gin. In fact, many attribute the invention of the cotton gin, the expansion of cotton plantations in the South, and the dramatic corresponding increase in the number of imported slaves as the primary causes of the American Civil War. Some even credit Abraham Mordecai and Eli Whitney. Whatever the case, Montgomery, Alabama epitomized the rise of the South. It was one of its crown jewels. But its time in at the top was short. On April 12, 1865, following the battle of Selma, Major James Wilson Union soldiers captured Montgomery for the North. The Montgomery I walked into in 2019, its history forever altered by the abolishment of slavery in America, was of course very different than the antebellum South. 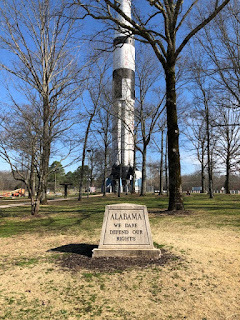 I figured that, but I was surprised at what I was to learn, not just about Montgomery but the rest of the South, at the National Memorial for Peace and Justice. In Montgomery I became witness to what I believe is the most painful and most shameful period of not only the South’s history, but America's. Uncharacteristically, the mood in the Montgomery, Alabama Waffle House the next morning was tense. The small yellow and black building, with its two cooks and four waitresses, was crammed with hungry people. I like to sit at the counter in front of the grill and watch the cooks, but all those stools were taken. I found one remaining seat on the side counter, where waitresses make up to go orders and do their other work. WH staff have big name tags. Michelle was working in front of me, frantically popping waffles hot off the iron into round plastic containers, eggs, hash browns, bacon and sausage into square ones, drawing down drinks, stuffing them into various paper bags. I had no idea Waffle House did such a take-out business. To say the place was cooking would be both terribly corny and an understatement. Angie, my waitress, was an older white woman who seemed oddly serene in a sea of stress. She moved slowly and deliberately, with a permanent smile on her face. Michelle, her young black co-worker, took notice. The woman next to me, having eaten, was waiting for a take-out order before leaving. She sighed and squirmed, non-verbally complaining that she thought her order was taking too long. Michelle checked a ticket near a sack at the end of the counter. As she did Angie methodically opened cabinet doors below the counter, checked cartons on shelves above the counter, and looked lost and bewildered. Michelle had seen enough. Take out syrup is that small sealed plastic package of sweetness you get in the sack with your waffle. Angie stood in front of me while she poured syrup from a pitcher into the cup. She must have realized I was taking it all in. She leaned in by me and spoke softly. Angie smiled and cocked here head towards Michelle. Then she carefully put the syrup into the sack of the impatient woman beside me who went quickly on her way. Perhaps the busiest person working at the Waffle House that morning was the waitress doing dishes. There are only two jobs that I can see at Waffle House, cook and waitress. The cooks fry the eggs, ham, bacon, sausage, steak, pork chops, and hash browns. The waitresses do everything else; make the coffee, dish up the grits, make the toast, run the waffle irons, do the dishes, bus the tables, set the tables, and check you out when you’re done. That morning in Montgomery one young waitress was full time on the dishes. She was heavily inked with tattoos on her forearms and had white girl dreadlocks covering her back. 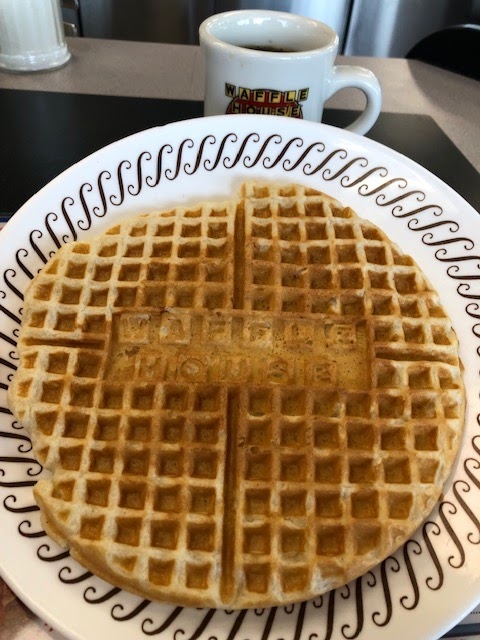 I think I know now why Waffle House coffee cups are so thick and their plain white plates so substantial. Cups, saucers, plates, silverware, and water glasses were getting slammed through steaming hot water, rinsed, dipped, and thrown onto a drying rack. A steady flow of dirty dishes piled up on the dishwasher’s left, and clean dishes reappeared on her right, only to be grabbed by the waitresses, quickly wiped, and stacked where they and the cooks could press them back into use. The sinks were a frantic area. The dishwashing waitress didn’t talk, never stood up straight, just kept everything moving. From where I sat I had a great view of the waffle irons. On the counter next to them were big white bowls of batter, and in them long spoons. The batter was so thick it held the spoons up. When I make waffles and pancakes I pour the batter. 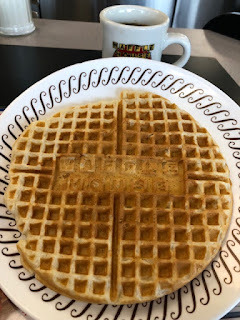 The Waffle House operation involves spooning thick batter onto the waffle iron and spreading it around. Their batter sticks to the spoon. The waitresses bang the spoon loudly on the edge of the bowl so the extra batter sticking on it falls back into the bowl. Thick stuff. Maybe that’s what makes them so good. Finally, Angie took my order. Before I could start she gave me this warning. Saying they were out of city ham meant they still had country ham. I had had a lot of time to think it over. I wanted grits but it was of little matter. There’s something about southern waitresses and those endearing terms they use (maybe it’s the drawl) that damn near makes me blush. She was back within ten seconds. “I am so sorry.” She was sincere. About that time one of the two cooks, a woman wearing a baseball hat completely covered with buttons, walked by me in a huff and a hurry. She had a disturbed look on her face and a big stainless steel bowl. She disappeared into the back room. When she returned the bowl was filled with eggs. She put them down by the griddle and made a very loud general announcement to everyone. The other cook, tall and thin, the only man on staff, reacted not at all. He went on quietly spreading out strips of bacon, laying down sausage links, doing his job. He cracked his eggs as smoothly as anyone I’d ever seen. It looked like he barely touched them on the edge of the griddle and then was opening them up, one handed, into a bowl before tossing the shells and pouring them carefully from the bowl onto on the griddle. All in one easy motion. That's artistry right there. He scattered hash browns over the grill and gathered ingredients. I had a feeling they were mine, and by watching what he added to them my hunch was confirmed. Or I could have gone completely crazy and ordered my hash browns “all the way” which is scattered hash browns with everything above. I’ve never had it and never seen it ordered. It is insane to even imagine-cheese and chili and sausage gravy? But it’s on my bucket list. When Angie brought my order it was pristine and beautiful. I had a full plate of hash browns, another plate with my waffle right out to the edges, and a platter of eggs with four half slices of hot buttered rye toast. She filled my coffee mug up to the brim. It was steaming. Angie smiled. I swear I like Waffle House more every time I go there. As I was dipping a corner of my rye toast into the runny yellow yolk of my first egg the back door opened and a sheepish young man rolled a dolly stacked with cardboard boxes into the restaurant. The male cook, Randy I had learned, came up to him, reached for the clipboard he was holding, counted and checked out the boxes, and signed for them. In a few minutes Angie appeared with a large glass of cold white milk. When I left I gave Angie a nice tip on the counter. At Waffle House you pay out at the register. The place had cleared a little but there was still a line to pay. The dishwasher with the tats and dreads, now caught up on the dirty dishes, took my ticket and started to make change for me. My day was rolling, I’d had a great breakfast, and I was happy. I softly whistled a Cee Lo Green song. The cashier recognized it. She looked up at me with a mischievous grin. I was whistling one of Cee Lo’s catchiest tunes, not his best song but certainly his most popular, largely because of its raunchy lyrics. I was a little embarrassed. It wasn’t the lyrics I was thinking of, it was the tune. But I knew what she meant. I just smiled. When young people call me sir I feel old. But it was all good. We made a little connection there. People work hard bringing breakfast to America, and nobody works harder than the staff at Waffle House. I can’t wait to go back. I walked out of the Birmingham Civil Rights Institute still immersed in the Birmingham of 1963. It was a nice late February Alabama day. I got in my 2006 Buick, turned left aimlessly at the corner, and drove into the Birmingham of 2019. Downtown is still developing, but it has a ways to go. Lots of empty buildings. I went down the hill, still thinking about Fred Shuttlesworth, and found myself in a neighborhood with lots of foot traffic. Nice sunny day. I stopped at a light and a crowd young people, black and white, walked in front of the Buick with backpacks and shoulder bags. I realized they were students, and I was on the campus of UAB, University of Alabama Birmingham. UAB is a big deal. It has 22,000 students pursuing studies in 140 programs and 12 academic divisions. UAB Health System is one of the largest academic medical centers in the United States. Its hospital houses the only Level 1 trauma center in Alabama. Combine the health center with the university and you have the state’s largest employer. Ten percent of the jobs in the Birmingham-Hoover Metropolitan Area are related to UAB. Every city has lots going on, but it would be a mistake to think about Birmingham today without thinking of UAB. I on the other hand was thinking about barbeque. I turned left once the students cleared out in front of me and found myself near a nice fountain in a crowded old section of Birmingham. I was in the 5 Points neighborhood. I parked and got out on the street myself. I began to whistle. My trip was going well. A man on the street spoke to me as I walked by him. He turned and walked beside me. Without responding I began to whistle “The Fishin’ Hole,” a song written by Earle Hagen and whistled by Fred Lowrey, a blind whistler from Jacksonville, Texas. Most people don’t know it has lyrics. Here they are. If you think of the tune as you read the words you can get the rhythm and match up to the beat after a while. It goes on, but you get the idea. That song, like the show, played off the lazy small town old South; the South of catfish, Aunt Bee’s homemade pies, southern drawls, and the good ole days. I don’t want to burst your bubble here, but could be that South is gone. Not that it was ever real. Was it really possible there were no black people in Mayberry? I whistled the whole song, plus the repeat at the ending. My new friend laughed and laughed. A few people around us smiled. He laughed again. I had to admit he had a great laugh. I gave him two ones. He shook my hand while laughing more, thanked me, and walked back towards the fountain. A good laugh goes a long ways. I turned into Jim N Nicks BBQ there on 11th avenue. I was looking for a southern joint. A hole in wall. I didn’t get it, and I knew immediately. Jim N’ Nicks had merchandise displayed on a nice rack as soon as I walked in. Black baseball caps with white letters in a fancy font for $20. Hip tee shirts. Bags of cheese biscuit mix in unbleached muslin bags for $6. Summer Grillin’ Packs of bottled sauces for $40. Joints don’t have slick stuff like that. Corporations do. I almost turned around, but then I saw the handles of what looked like a good selection of draft craft beer at the bar. While Jim N’ Nicks did start in an old pizza parlor on Clairmont Avenue in Birmingham in 1985, it now has 34 restaurants in 7 states. Its website says it has become a Southern Institution. I’m not sure I agree. Websites say all kinds of stuff. The food does the serious talking. I had the southern deviled eggs, smoked riblets (something like rib tips without the gristle) cole slaw and baked beans with a local unremarkable ale. I can’t say it was bad. The deviled eggs were sweet but bland. I was expecting more of a mustard zip. The cole slaw didn’t stand out in any way and the beans could have been smokier. But while sides matter, a lot I think, the real measure of a BBQ joint is the pork. The batch of pork I ate had the good smoke taste that only comes with a dry rub made with a lot of spice flavors, but it was strangely not well cooked. It was done mind you, but it lacked that fall apart soft texture I thought was coming. Maybe the slab of ribs would have been different. I tried their sauces, which were good, but overall I was underwhelmed. I’d go back if I didn’t have the time to look for something better, but I don’t think I will anytime soon. The nearest Jim N’ Nicks is in Nashville anyway. I’d brought the atlas with me. As I finished my ale I looked for a two lane highway to Montgomery. It looked like Route 31, which turned into Route 3, was my best bet but danged if it didn’t keep crossing 65. Seemed like I couldn’t get away from that big southern highway no matter what. While crisscrossing the Interstate, Route 3 took me through Calero, Jemison, Clanton, Cooner, and Pine Level. 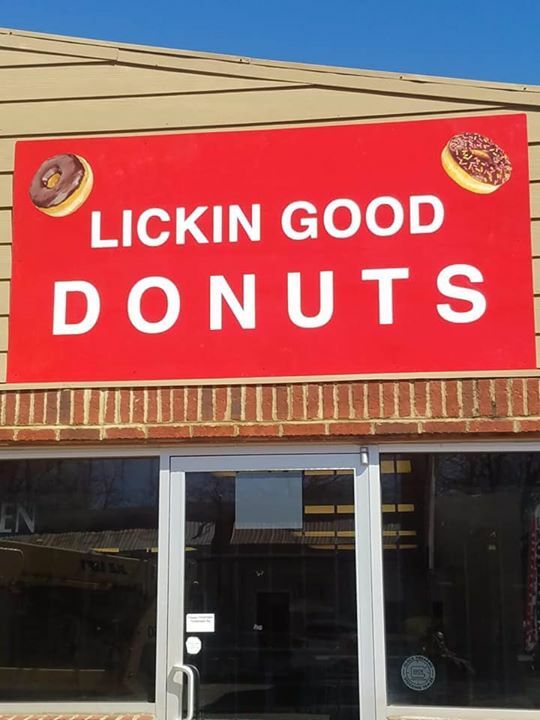 I’d wished I had gotten to Clanton of a morning, because they had what looked to be a good little independent donut place called “Lickin’ Good Donuts.” I’d yet to find locals to talk to in any extended way, and I was anxious to see what they were thinking about politics and the direction America was headed. When I got to Montgomery it wasn’t easy finding a place for the night. There must have been something going on in town, or the legislature was in session. Montgomery is Alabama’s capitol after all. Everything seemed over priced or full, but I finally found one of those “suites” place with little kitchenettes. Odd that the room was so cheap, plus it offered a dinner buffet in the price. The crowd in the breakfast/dinner area was seriously preoccupied. Everyone, and I mean everyone, was looking at their phone. Phone booths may be a thing of the past, but we have created walls around ourselves when using our smart phones, without talking now, that separate us just as much as those little enclosures ever did. If you watch people on their phones, which I do, you can see the emotion of their silent conversations. Some smile while texting away, others laugh, and just as many frown, hunch over, and frantically respond to god knows what kind of news is coming their way on the tiny screen with the little letters. We’re living in our heads now more than ever I’d say, not that I’m much different. I had a couple of tacos and a lemonade and called it a night. I’d seen a lot that day, all by myself, and I had a lot to think about. 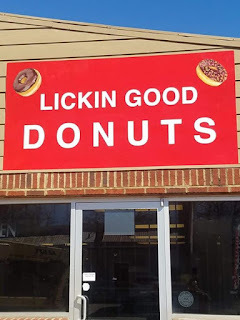 Before I plugged in my laptop and began researching Fred Shuttlesworth, I looked up Lickin’ Good Donuts for the sheer hell of it. Turns out they are a Limited Liability Corporation operating in at least three states with I don’t know how many locations. I swear I’m losing my eye for small business. Birmingham Alabama is entirely a post civil war city of the South. It was strategically established in 1871 at the intersection of two railroad lines. In 1880, fifteen years after the end of the civil war, Birmingham’s population was only 3,086. Twenty years later, in 1900, it had grown to 12 times that size (38,000). In 1930 the population swelled to 260,000 and it peaked in 1960 at 341,000. Birmingham’s growth was fueled by an influx of African Americans who fled the fields of the old agrarian rural south, escaped the new business model for cotton growing-sharecropping, and moved to the city. Birmingham slowly developed into the Pittsburgh of the South, using nearby coal and iron ore deposits. Its steel industry was symbolized at the 1904 St. Louis World’s Fair by a 55 foot tall cast iron statue “Vulcan,” now located in Birmingham. Black urban residents of Birmingham found work as miners, foundry workers, domestic workers, barbers, pastors and more. Segregation in an odd way helped create the fabric of a new urban black community. At the heart of that community were black churches. Those black families arriving to Birmingham may have been poor, but they lived as free men and women in a new city and a new South. After the civil war and the emancipation of the slaves a new system of control replaced the relationship between black slave with white slave owner. The racial divide never narrowed, in fact many historians believe it widened. Segregation hardened, discrimination held strong, and a new means of controlling America’s black citizens emerged, white terrorism. Birmingham would later earn the nickname Bombingham during the Civil Rights Movement due to 50 dynamite explosions that occurred in the city between 1947 and 1965. All but a handful of those crimes went unsolved by local authorities. While America as a whole grew more liberal in its views on racial equality, led in theory if not practice by the North, communities throughout the South dug in their heels. 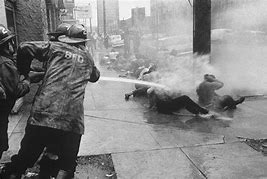 Black citizens of America living in places like Birmingham grew more defiant in demanding justice and equal treatment, and as they did a faction of Birmingham’s white citizens grew more violent in their response. That violence, and the rhetoric that supported it, was epitomized by the Ku Klux Klan. The murderous bombing of the 16th Street Baptist church was the logical culmination of a long process of lawless terror in Birmingham perpetrated by whites against the black community. After encountering Fred Shuttlesworth’s likeness cast in bronze outside the Birmingham Civil Rights Institute, I went inside to learn more about the real man. Fred came to Birmingham from rural Alabama at age 31 to become pastor of Bethel Baptist Church in 1953. I was two years old when he began his work at that church. 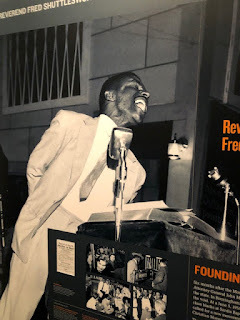 Fred was one of the new black preachers in the South who risked alienating members of his congregation by spending as much or more time working on “the movement” as he did with weddings, funerals, and other traditional church functions. 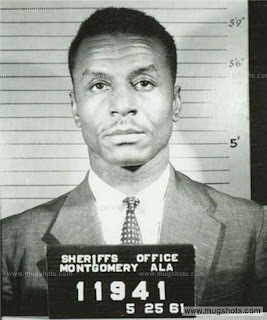 By 1956 he was membership chairman of the Alabama chapter of the NAACP (National Association for the Advancement of Colored People) until the Alabama legislature outlawed that organization from operating within the state. In response, he and Ed Gardner established the Alabama Christian Movement for Human Rights (ACMHR) that same year to take up their important work. The ACMHR raised almost all of its funds from local sources at mass meetings. Fred Shuttlesworth led those meeting with his fiery rhetoric. Money poured in. The ACMHR demanded the City of Birmingham hire black police officers. When the city ignored their demands they sued. When the U.S. Supreme Court ruled that bus segregation was unconstitutional in Montgomery, Alabama Shuttlesworth announced the ACMHR would challenge segregation laws in Birmingham with large demonstrations and another lawsuit on December 26, 1956. Fred Shuttlesworth and his wife Ruby attempted to enroll their own children in a previously all-white public school in Birmingham in 1957, and were attacked by a mob of Klansmen. The Birmingham Police were nowhere to be seen. That mob beat Shuttleworth with chains and brass knuckles in the street while someone stabbed his wife. One of their assailants that day was Bobby Cherry, who would be convicted in 2002 on four counts of murder and sentenced to life in prison for his part in the 1963 bombing of the 16th Street Baptist Church. Shuttlesworth drove himself and his wife to the hospital. The Shuttlesworth children, having witnessed their parents’ public beating, were outraged. At the hospital Fred instructed his children to forgive their assailants, while rededicating themselves to end segregation through non- violent confrontation. Shuttlesworth participated in sit-ins against segregated lunch counters in 1960 and took part in helping, somewhat reluctantly, the Freedom Rides sponsored by CORE (Congress on Racial Equality) in 1961. When consulted about the rides he warned that Alabama was extremely volatile. He thought other actions could be taken that were less dangerous. Despite that, the rides continued. After the Riders were badly beaten and nearly killed in Birmingham during their ride there, he sent deacons from his church to pick up the riders from a hospital in Anniston. Shuttlesworth took in the Freedom Riders at the Bethel Baptist Church, providing them sanctuary and allowing them to recuperate after the violence that had occurred earlier in the day. Attorney General Robert Kennedy, anxious to see the Freedom Rides come to a peaceful conclusion, gave Shuttlesworth his personal phone number in case the Freedom Riders needed Federal support. When Shuttlesworth and the Riders prepared to leave Birmingham and reached the Greyhound Terminal, they found themselves stranded as no bus driver was willing to drive the group into Mississippi. Shuttlesworth stuck with the Riders and called Kennedy. Prompted by Shuttlesworth, Kennedy tried to find a replacement bus driver but even his efforts proved unsuccessful. The Riders then wisely decided to take a plane and fly over Mississippi to their final destination of New Orleans. Shuttlesworth helped them get to the airport and onto the plane. Fred proved indispensable to any of the movement’s actions taking place in Birmingham. Working through the Southern Christian Leadership Council, Fred Shuttlesworth and Martin Luther King brought a new level of non-violent confrontation to Birmingham in the spring of 1963. I was 11. An effective economic boycott of white Birmingham businesses began in April, along with daily protests. These actions were of such a scale and frequency that national and international news sources began daily coverage of the events. On May 2nd plans were enacted to begin the Children’s Crusade. Thousands of children, primarily teen-agers, left the 16th Street Baptist Church in groups, heading throughout the city to engage in peaceful protests. One of their goals was to engage the Mayor of Birmingham in talks. They marched to a park near the 16th Street Baptist church where they summoned the mayor to speak to them. They were not met with a peaceful response. Hundreds of minor children were arrested, hauled off to jail, and detained. The next day, May 3rd, more children took their place. On this day, the Birmingham police and fire departments responded differently. They turned fire hoses on the demonstrators, and set police dogs upon them. National TV networks aired that grainy black and white footage of institutional government violence inflicted on young black citizens of Birmingham on news shows all across America. Many believe the tide against segregation in America reached a tipping point that day. On May 3, 1963 I was an eleven year old kid sprawled in front of a fuzzy television set in a farmhouse in Illinois. We had finished milking the cows and I was watching the news while Mom fixed supper. Dad was sitting at his desk in the other room. I turned up the volume to catch more of the sounds of screams and chaos pictured on the screen. Kids were being knocked down by powerful jets of water. Dad walked in and stood behind me. Our eyes were glued to the images on the screen. The sound of loud barking came into the living room. 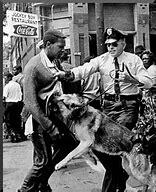 Policemen were letting dogs lunge at black boys trying to get away. One dog caught a kid’s arm and wrestled him to the ground. “Those are German Shepherds,” I said. A boy in Danvers had teased a neighbor’s German Shepherd which was on a chain, poked at him with a stick they said, and the dog got a hold of him and mauled him. The owner shot the dog and the boy had operations. His mouth was misshapen, his eye socket pulled down on one side. The police were letting those same dogs loose on kids in Birmingham. On May 5th even larger crowds of protesters gathered outside the Birmingham jail where children were still being held. News coverage continued. On May 10th city businesses agreed to begin desegregating downtown department stores and businesses. Desegregation had won a major battle on the streets of Birmingham Alabama. The Civil Rights Movement would never again be ignored. There in the Birmingham Civil Rights Institute I watched that same black and white footage I had viewed 56 years earlier on an old TV not unlike the one we had in our farmhouse. I remember that day in 1963 clearly. So do many more I am sure, including some who were there. Near the exit of the Institute is a large set of windows facing the park where the Children’s Crusade took place that day, where children were knocked down by fire hoses and attacked by dogs. Under the window was this plaque, one among many telling the story of that day. It was the words of a mother concerned for her child. I sat on a bench and read it. You can learn a lot in a short time. I had no idea how many events crucial for the Civil Rights Movement happened in Birmingham. Where did those young Birmingham black kids get such courage? I think they got it from listening to the words of Fred Shuttlesworth, and watching him live his life among them. How many of us would be so brave? Soon after crossing into Alabama from Tennessee on I-65, near Ardmore, you hit the welcome center. These welcome center deals vary from state to state. Some are just the first rest area on the interstate when you cross the state line with an extra rack of pamphlets in the lobby. Others are built out, tricked up, staffed, and designed to be special. Alabama went all out in its center welcoming visitors on Interstate 65. I rarely miss a visit to a welcome center, whether I have to use the facilities or not, but this one is especially hard to ignore. That’s a 224’ Saturn 1B rocket sitting on a concrete pad near the entrance of the Alabama Welcome Center. Huntsville, Alabama is home to the second largest research park in the United States and to the U.S. Space and Rocket Center and its popular educational program “Space Camp.” German scientist Wernher Von Braun arrived in Huntsville in 1950 and led the development of rocket technology that carried American astronauts in space, and at the same time of course advanced the reach of long range intercontinental ballistic missiles designed to carry lethal nuclear warheads. Along a more pastoral vein, also near Huntsville is one of the northern most golf course along the Robert Trent Jones golf trail, Hampton Cove. That trail of beautiful old golf courses, 26 in all, at 11 locations, offering 468 holes of golf, was designed by famous golfer Bobby Jones and stretches from The Shoals course in Muscle Shoals to Lake Wood in Point Clear on Alabama’s gulf coast. I’m told if you get started on one end or the other you can golf 18 in the morning, drive to the next course, find yourself some good southern food and hospitality, libations most likely throughout the afternoon and evening, play a nearby golf course the next morning, and repeat for as many days as you like. Sounds like a wonderful way to spend a couple weeks or more. But I digress. This Alabama welcome center had what looked like a recently added building housing a staffed information counter and racks and racks of pamphlets for all the wonderful things you can do in Alabama. Swim on the beaches of Gulf Shores, gamble in the casinos near Mobile, raft in the rivers, fish, take your kids to a water park, visit old mansions and plantations, all the stuff. But I couldn’t find what I was looking for. She looked at me quizzically. A younger man with a name tag and a vest, just coming in the building, heard me. He pointed to a counter in the corner where sat a small rack with space for four pamphlets. Three were filled. There was a pamphlet called United States Civil Rights Trail which listed museums and other sites in 14 states, a pamphlet printed by the U.S. Dept. of the Interior on the Birmingham Civil Rights National Monument, and a pamphlet for the new national Memorial for Peace and Justice, commonly known as the lynching museum, in Montgomery. I took one of each. Of equal interest to me was the stone marker outside the welcome center. 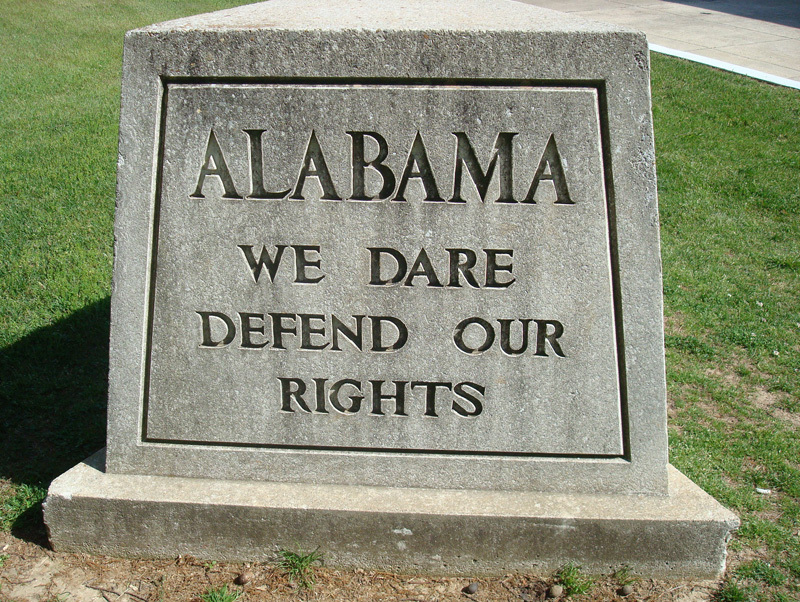 It was inscribed with the state motto “We Dare Defend our Rights” which I found out was adopted in 1923. Alabama’s motto begs two questions. What rights were they talking about in 1923? And whose? I drove straight to Birmingham, Alabama and made my way downtown to the 16th Street Baptist Church. When I walked in the sanctuary a man was speaking to an all black audience of school kids and teachers. I took a seat in the back pew and listened. I learned that 15 sticks of dynamite were planted beneath the steps on the east side of the building, outside the church’s Sunday school rooms. They were connected to a timing device set to explode at 10:00 a.m., well after Sunday school started, on Sunday, September15, 1963. That explosion killed 4 black girls: Addie Mae Collins (14), Cynthia Wesley (14), Carole Robertson (14), and Carol Denise McNair (11). 22 others were injured in the blast. Four white segregationists, known members of the Ku Klux Klan, were implicated in the crime: Thomas Edward Blanton Jr, Herman Frank Cash, Robert Edward Chambliss, and Bobby Frank Cherry. There were no prosecutions until 1977, when Robert Chambliss was tried and convicted of first degree murder of Carol Denise McNair. Thomas Blanton and Bobby Cherry were each convicted on four counts of murder and sentenced to life imprisonment in 2001 and 2002 respectively. Herman Cash died in 1994 and was never charged for his alleged involvement. The speaker took a long time to answer. While I was inside I went to the lower floor of the church into a large conference room with smaller rooms on the outside wall. They were the Sunday school rooms being used that morning the four girls were killed by the bomb. I walked outside the building to the east side of the church where the bomb was planted under the stairs and looked in the window. A new brick wall separated the bomb was planted the Sunday school rooms I’d just seen from the inside. The dynamite, that morning in 1963, blew the bricks and mortar of the old wall into the rooms where children were gathered. I took a big breath, stood up, and walked across the street. Outside the Birmingham Civil Rights Institute is a life size statue of Fred Shuttlesworth. Here he is pictured in a more familiar role. Speaking loudly, above a bible, from a pulpit. Birmingham’s International Airport is named after him. I didn’t know who he was or what he had done in Birmingham to gain such fame. His story was one of the many things I was about to learn. The trouble with old people, just one of the many troubles old people suffer, is they take what they encountered personally or learned from others in the past as truth and ignore new information. The world changes without them. History is not so much rewritten as it is scrutinized and made fresh with new facts. Old people think they know things, when in fact it’s often only half the story. I had a smart uncle who read ravenously, talked about ideas and other places, and was always trying to learn new things. Uncle Ed could truly have been called a life-long learner. Trouble was, he was a farmer in a little town, never went to college, and had limited access to information such as a good library or a home computer One of my nephews, reacting to me characterizing him this way, made this observation. He was right. Give Uncle Ed a laptop, WiFi, and a rudimentary knowledge of search engines and the world would have opened up to him like a present on Christmas Eve. He never lived to see it, but you and I live in a new time. Never has life been richer for the curious, regardless of age. Properly equipped and connected people now have scant excuse for ignorance. Not only can you learn something new every day, you can use that new information to change how you view the world. With Uncle Ed as my inspiration, I set off on a road trip to learn and experience new things. My companions were a 2006 Buick Lucerne, a Rand McNally road atlas, a smart phone, a laptop in the trunk, a thermos of coffee, and a sack of CD’s. I left well before dawn on a Tuesday morning, the 26th of February. By the glow of its dash lights in the garage the Buick revealed 134,548 miles on the odometer. Driving in the dark is not a good way to go. With little traffic, the Buick and I sped through the darkness, following our headlights as if we were in a tunnel. As the day slowly brightened, somewhere on Interstate 65 in Indiana near the Lowell exit, I made out this message, black letters hand painted on a white 4x8 sheet of plywood wired to two steel fence posts. I don’t believe in hell as an eternal destination, or heaven for that matter, but something about that warning seemed a bad omen. The fact that this blunt message was conceived and created by an individual, using their own resources, painting it freehand and displaying it for the world to see, told me someone believed the opposite of me in an emphatic way. It woke me up. I poured myself a cup of coffee and started paying attention to my surroundings. I’ve chronicled trips in the past, noting each little town, each state road. On some road trips I’ve managed to avoid interstate highways entirely. That’s hard to do, and slow going, but you see such a different side of America. My plan this trip was to concentrate on Alabama. I was determined to get there as quickly as possible, and that meant Interstate 65. After you pick it up in Indiana 65 is a straight shot south to Birmingham, via Nashville. While at times it’s picturesque, I 65 is like all the rest of our interstate highways; bland, controlled, banked and curved identically, one overpass exactly like the next. With the advent of self driving cars interstate highways might well evolve into something like train tracks without the rails, carrying zoned out people reading their phones, sleeping, god knows what. This being 2019 I still had to pay attention to where I was going and what I was doing, though cruise control helped a lot. The speed limit was 70. I put the Buick in the left lane, set it on 79, and leaned back. That entire first day I didn’t turn on the radio. I just thought. There is something to be said for a good long think. I can’t say exactly what I thought of, but by afternoon it felt like my head was less cluttered, as if I had stored nagging thoughts away into marked compartments, hid others in places where I was likely to find them, and threw others out entirely. In the end I was able to move new ideas into the newly cleared space, unfold and examine them, see them more clearly. I’d been waiting for that feeling all winter. The day shaped up to where I figured I could make it past Nashville before looking for a hotel. I like to drive past big cities so I can take off in the morning on open road without much traffic. I didn’t take the beltway, instead I just plunged through Nashville on I 65. Thought I’d see what downtown looked like these days. Big mistake. Later in the trip a young bartender in Memphis, talking about his city’s growth specifically and Tennessee’s in general, described Nashville as a “sponge that can’t hold any more water.” After my drive through downtown I knew exactly what he meant. I could feel Nashville close in around the Buick. Brake lights lit up ahead, cars changed lanes, horns honked. And all the while we were slowing, cars bunching up, getting closer. Finally we came to a stop. There are cranes on the horizon on top of new building shells in downtown Nashville. Apartment buildings with tiny balconies are built right out to the interstate. I imagine rents have gone way up. New construction is overtaking the old. I had plenty of time to look around. We weren’t going anywhere. There were flashing lights ahead. Probably an accident. The exits were jammed too. I hate it when that happens. Time usually equals distance on road trips but in Nashville the Buick and I were frozen in time like a fly in an ice cube. All the cars, the Buick included, idled. Exhaust filled the air, and the sun began to set. I imagined the cars on the beltway leaving the city behind. I tried to conjure up my most Zen like attitude. But it’s not easy being tranquil in traffic. I have never found the answers to two questions I first asked as small town farm kid when encountering too many people. Where did all these people come from? Where in the heck are they going? By the time the Buick got back up to 35 miles an hour it was almost dark. I got off I 65 at the Brentwood exit. It was equally jammed with cars. Google maps was rerouting me onto what I thought would be back roads, but I don’t think there are any back roads in Brentwood. The whole area looks like it was built last year. But then it was dark. All I really saw with the help of the Buick’s headlights were the faux fancy signs and guard booths of gated communities, strip malls, over engineered streets with turn lanes, one ways, stop lights and my new favorite-roundabouts. Give me a regular street with two lanes and a sign in front of the building I am seeking any day. After looping around suburbia I could see the sign for the Holiday Inn Express I was trying to get to but how to travel there was a complete mystery. It was if it was floating behind a shopping center, not quite off a service road, somehow related to an Outback Steakhouse and a gas station. My smart phone was equally confused. I’m not sure how I finally pulled up in front of the place. Upon entering, an over friendly hotel clerk handed me two bottles of water and began gushing about all the services they offered, the free hot breakfast in particular. Outback appeared to offer the closest and fastest way to get dinner. I sighed, but I was too tired and hungry to argue. He then launched into a litany of lights, turns, a one way street, a roundabout. I’m just polite when directions go past about three steps. My mind shuts down. I nodded like I understood. I figured I’d find it, asked him to hold my bags till I got back, and thanked him. One more trip in the Buick and my day would be done. I did find it, after about ten minutes of U turns and rerouting from the barking woman in my smart phone. I wish I could figure out how to change that voice. I ended up in a parking lot of a doctor’s office or something right next to the place, unconnected. Why they don’t link up those parking lots I’ll never know. I just parked there and walked across the tiny no man’s land between the lots. It was crowded but a place for one is usually easy to find. I was prepared to sit at the bar but they squeezed me into a little table. When the waiter came for drinks I ordered a bourbon, a salad, and a burger. I followed it with another bourbon. There I was in suburban Brentwood at a Cheddar’s. It was not the South I was looking for, but it was the South all the same. Long day. Tomorrow I’d be in Alabama. I was in a tee shirt and shorts. The sun was starting to set and it was a little chilly, but I was drinking in the good weather and the beauty of the lake. I surprised myself in a way but I know well the place from where that quick answer comes. My kids are here, working and succeeding in Chicago less than a hundred miles away. I have two brothers and a sister living in Illinois, one who moved back from California to be near us among other things. I have lived in my small community of Ottawa, off and on, mostly on, since 1973. I attend a church here that is important to me. I have familiarity with the area, to say nothing of my house which has been my home since 1987 and is now paid off. I have my garden, my neighbors, and most importantly good friends. While I designed the shack to be technically portable, able to be picked up, transported by semi with a low boy trailer, down the interstate without even a WIDE LOAD sign, and placed in another beautiful spot anywhere simply by pouring four level concrete posts and dropping it on them, I have a feeling the shack it not going anywhere either. And I’m certainly not going anywhere without it. Illinois’ winters are not my favorite, especially as I age, but I get a little giddy with the beauty of spring, summer, and fall in the Illinois Valley. For me it’s a no brainer. I was born a hundred miles downstate, grew up on a farm, as did my parents and their parents as well. I hope to always take trips but I am fairly certain I will always come home to Illinois. As the Guatemala trip progressed I quietly inventoried what keeps me in Illinois, pondering the reverse of that question too. What would compel to leave my home? Certainly not the weather, but what? Vacations are a good time for long thinks. I gave that question a lot of thought. Twice a day for four days we chugged across Lake Atitlan to our eye clinic in San Antonio Polapo. There is no road that circles the lake. Roads that do exist are in very poor condition. Our clinic was staged in an evangelical church halfway up the steeply sloped hillside village. Our patients were mostly local but some traveled from nearby villages by bus, boat, or on foot. They were primarily Mayan Indians. About a third of those seeking eye care spoke no Spanish, but rather Pre-Columbian languages, Tz’utujil and Kaqchickel, two of the reported 21 Mayan languages spoken in Guatemala by its Indian population. Many of the American volunteers know enough Spanish to get by, but none of us know those ancient languages. It slowed us down a bit, but brought us closer to local volunteers, speakers of both Spanish and the Mayan languages and sometimes English as well. They were primarily young people able to spend days with us in the clinic. We became close with them over the four days. It’s one of the benefits of volunteering that surpasses the experience of most tourists. The lake we traveled across is the deepest in Central America, over 1100 feet at its greatest depth. It covers an area of about 50 square miles and is ringed by villages named after Christian biblical figures, the apostles, John the Baptist, etc.. However most are tagged with a Kaqchikel or Tz’utujil modifier. I asked locals on the boat dock what the word Palopo meant, which followed Saint Anthony (San Antonio) as the name of their town. They looked at each other, discussed it in depth in their native language, looked quizzically at each other, and then replied in Spanish that it didn’t translate. They shrugged, looked a little sheepish, but left it at that. The fact that the Mayans have preserved 21 separate languages, maintained their traditional dress, incorporated their ancient religion into Christianity, and kept community intact in small villages where life is hard is testament to the strength of their Mayan culture, which began in 2000 B.C, collapsed as a civilization in 900 A.D., but lives on today in the everyday lives of the rural indigenous people of Guatemala and elsewhere in Central America. The separateness of Guatemala’s Indian peoples has been aided, unfortunately, by a Guatemalan national government which has always excluded them. The government is dominated by Mestizos, those of mixed European and Indian ancestry, who are the oligarchs of Guatemala, the rich ruling class which controls both elected officials and the military. 55% of Guatemala’s nearly 17 million citizens are indigenous, the vast majority of those Mayan Indian, yet the indigenous have never been in control. History plays a part in the now of every country. On the surface Guatemala is filled with bright colors, friendly people, and wonderful weather. But Guatemala’s history has a dark side. During the Guatemalan Civil War (1960-1996), Lake Atitlan was the scene of terrible human rights abuses, as the government pursued a scorched earth policy. Indigenous people were assumed to be universally supportive of the guerillas fighting against the government, and were targeted for brutal reprisals. At least 300 Maya from Santiago Atitlán, a large town on the lake near our clinic, are believed to have disappeared during the conflict. That conflict was fueled in the early 1980’s by the rise of Daniel Ortega’s leftist Sandinista government in Nicaragua, and the U.S. government’s support and funding of the “Contras” a reactionary force organized to quash the guerilla movement. In Guatemala that resistance took the form of death squads, vigilante groups aiding the army which acted with impunity against native villagers. Two events of this era made international news. One was the assassination of Stanley Rother, a missionary from Oklahoma, in the church at Santiago Atitlán in 1981. In 1990, a spontaneous protest march to the army base on the edge of town was met by gunfire, resulting in the death of 11 unarmed civilians. But the bulk of the resistance, and subsequent killings by the death squads, was away from the lake, in a mountainous triangle defined by the towns of Quetzaltenango, Huehuetenango, and Santa Cruz del Quiche. No one knows how many people throughout Guatemala died in that conflict, but all agree the overwhelming majority were indigenous people. Estimates put the number at 200,000 souls. Mass graves were discovered, but many of that number simply disappeared, never to be heard from or seen again. That is the quiet backdrop against which life in the rural highlands of Guatemala plays out. Families and communities recovering, with individual traumas still being overcome. Older people remembering the reality, young people hearing their stories. And so we brought the rural people of Guatemala glasses. Because of the difficulty of local travel, the time and expense required of patients to travel to the clinic, we served but 950 people in four days. That is below our capacity. But those that made it to us needed help substantially. They were infinitely patient. We Americans are always impressed at how kind the individuals in the clinic are to each other, and to us, during the long wait. Family members accompany the elderly. Mothers bring their babies and toddlers. Amazingly few of those children cry or act out. Our intake form, a vital piece of paper that gives us a snapshot of each patient’s life and vision problems, asks if the patient can read. A fair number, mostly older, said no. Most never had an eye exam or had worn glasses, even those with the most extensive visual problems. We brought about 6,000 pairs of glasses given to us by the Lion’s Club, which were cleaned, evaluated, and sorted into boxes back home. They formed a catalog of prescriptions we matched as closely as possible to the one suggested by one of our eight eye doctors. It works amazingly well. We provide substantial help, if not a near perfect script, for what their eyes require. Let me tell you about just three patients I served, all in one morning. I called the name of a woman, Maria, without looking at her age. A quiet 7-year-old girl rose up from those waiting on folding chairs in response, her head bobbing barely above those still sitting. She was dressed in the colorful and intricate embroidered woven cloth that is used to make traditional skirts and blouses worn by the indigenous in Guatemala. We served a lot of children in this clinic, but few that were alone. I bid her good morning, asked how she was doing, and shook her hand. She smiled and spoke Spanish in return. I looked at her intake sheet. Maria had fairly bad eyes for someone so young. She was myopic, without astigmatism, but a fairly strong prescription, -3.50 sphere, was needed. A lot of correction for a 7-year-old. We had what she needed. I adjusted the glasses to her small face, and she was quickly done. A little later I was sitting across from a tiny elderly woman accompanied by her daughter. She was an Indian woman with a scarf covering her head and part of her face. I had her intake sheet and glasses selected by our volunteer pickers. She did not read or speak Spanish. They had selected a fairly standard bifocal prescription for her. She seemed shy. I unfolded the glasses, and reached to place them on her face. When she pulled back her scarf she revealed a large port-wine birthmark nearly covering the right half her face. The eye on that side appeared lifeless and blank. I checked the intake form. There was no prescription for the right eye. I looked at her daughter, and asked, just to make sure. I placed the glasses on her face and they were much too big. Old style goggles from the 70’s that rode way down on her cheeks. Hopeless. Then I thought of my friend’s glasses. He had given them to me late, and we were not able to include them in the boxes. I was carrying them in my backpack. They were small and light. When we arrived I asked a one of the eye doctors to determine their prescription on the portable lensometer. If I was right, that script was close to the one contained in the heavy pair of glasses currently sliding down that poor woman’s nose. I retrieved my friend’s donated glasses and it was the same prescription. I put them on her face and they fit perfectly. Small and sturdy, they had belonged to my friend’s mother, recently passed away. He asked me to give them to someone who needed them. I promised to both complete that task and take a picture. But I couldn’t. When I looked at her tiny face with the birthmark I just couldn’t request a photo. She was too self-conscious. I don’t take as many pictures of people as I used to for that reason. The little woman smiled, looked across the room, through her first pair of glasses ever, and began to speak rapidly in Kaqchickel, pointing to the sky, then pointing to me. I looked again to her daughter. We get a lot of bendigas or blessings in fitting. It’s where the process ends, where glasses are finally received, and improved vision is realized. It’s not fair really. All of the I Care volunteers work together to improve our patients’ vision. So do the people who give us glasses. I want to share that Mayan blessing with all of them, including my friend who gave I Care the gift of his mother’s glasses. It was my pleasure to put them to continued use, and put them on that poor woman’s face, on everyone’s behalf. The last patient showed up with Maria, my previous seven-year-old patient with the serious myopia. It was her father, who had been delayed in clinic due to having his eyes dilated. I was surprised to see her, but glad to see she was wearing her glasses. She smiled. Maria’s father, not unexpectedly, was also myopic. But his myopia was more advanced. His prescription was -6.00 sphere. The pickers had wrapped two strong pairs of glasses in his intake sheet. I read it. Day laborer. Lived in a nearby village. 32 years of age. He was wearing the kind of bedraggled glasses we often see in these clinics. Broken, scratched, held together with wire. This pair had a string in the back, tied to the temples, to hold them on his head. I asked if I could see them and he handed them to me. They were a wreck. Holding them up to the light and looking through them, I could tell they were not nearly as strong as the ones we had picked for him. I set them aside on a table, unfolded one of the new pair, and put them on him, hooking them over his ears. They fit him well. He looked around the room. He looked at Maria and they smiled at each other. I whistled and shook my head. That’s a hell of a lot of money for a day laborer in Guatemala. It’s a lot of money for anyone. Maybe he was robbed. I hoped that wasn’t rude, but I wanted to know. He seemed eager to answer. Unlike most of the Guatemalans in the clinic he seemed angry and anxious. I adjusted the new glasses which he would wear out of the clinic. Then I carefully cleaned and folded up his old glasses and returned them to him. After that I gave him the second pair of glasses we had picked for him also. We usually only dispense one pair to a patient. I decided on the spot he needed a backup pair. I also gave Maria a Pez dispenser, and pressed three packs of extra candies into her father’s hand. It was one of the princess Pez figures. Maria lit up like a candle. The father didn’t give me a blessing, instead we exchanged that cool handshake, the regular grip, the one where you hook thumbs, then back to the regular. You know it. The old hippie handshake. I wished him luck. Allow me to go back to the beginning. What would compel me to leave my home? I decided it would be one or a combination of these three things. o The inability to feed or otherwise support my family. o Living in fearing for my own safety or that of my family. o Genuinely believing the future held no hope. If I was Maria’s Dad I would leave Guatemala. Some McClure at some point left Scotland (we think), and sometime later my great grandfather left Northern Ireland to come to America. It’s very likely those same criteria played into their decisions. People are compelled seek opportunity and a better life. Should we blame them? The majority of legal asylum seekers that approach our country’s southern border are from Guatemala, Honduras, and El Salvador. The U.S. long ago stopped helping in their economic development in any material way, opting instead to invest in wars in the Middle East. Maria’s Dad, and possibly Maria herself, might well make that long journey out of desperation. I don’t think the man I gave two pairs of glasses will any day soon afford an airplane ticket and manage to obtain a visa. If you were convinced you must leave your home and your way of life where would you go? You would go where there is opportunity and hope. No country symbolizes those qualities more than ours. It’s one thing to think of immigration and the problems it presents as a matter of law and policy, but it is quite another to look poverty and despair in the face, while dispensing glasses, and judge those who seek a better life. Immigration, particularly in regard to our southern border and our Central American neighbors, will continue to be on the front burner of American politics. I ask you consider Maria and her Dad when you are confronted with talking points from both sides of our immigration debate. There’s a reality there that we cannot dodge. Our country has in the past, and continues now even if by default, to play a major role in the lives of our neighbors in this hemisphere. We have an obligation to think more deeply about what we are doing, and how it affects the lives of real people. I’ve seen them, talked to them, and shaken their hands. They are like you and I. Please remember that.